England: From Kevin Williams at Survival Skills, a report on the National Bike Safety Seminar at the Hertfordshire Fire & Rescue Service’s Training & Development Centre in Stevenage, Hertfordshire in England. The event was a one-day free workshop organised by Tony Smith, road safety coordinator for Hertfordshire Fire & Rescue Service and was an opportunity for road safety professionals to share best practice and improve strategies to improve the safety of riders. “The idea that the answer is ‘more training’ seemed to be a all-pervasive one, yet no-one seems to have identified that it’s not training riders well that prevents them crashing, it’s training them to avoid crashing which matters, and that is a totally different task. Getting them to understand where, when, why and how they are likely to crash is the important point. How does this “get into” training and influence future reports so that it becomes informed knowledge and no surprise? Survival Skills Rider Training is dedicated to improving motorcycle rider skills in the UK Since 1996, we’ve trained hundreds of riders of all standards from newly qualified to police licence holders, from IAM to RoSPA, from Harleys to Hondas. Survival Skills is a motorcycle training school run by BTEC-qualified advanced instructor and DSA-certificated CBT and DAS instructor Kevin Williams. Kevin is also a qualified ‘e-tutor’, with an NVQ in delivering training via distance learning. With over 30 years of professional riding experience Survival Skills specialises in post-test, advanced & online motorcycle rider training to instruct riders of all ages and abilities. Survival Skills provides a wide range of practical motorcycle training courses from convenient locations in England, Wales and Northern France, as well as distance learning options and free rider resources. Their aim is to offer a practical training course that’s differentiated from standard Roadcraft-based “defensive riding” training, focussing instead on Risk Assessment and Risk Management techniques to really understand the concept of hazards and how to cope with them and still enjoy motorcycling. Winners of a Prince Michael of Kent International Road Safety Award as part of the ‘Biker Down’ team in 2012 with Kent Fire & Rescue Service! The answer to solving the majority of motorcycle problems[accidents] is to SLOW DOWN,LOOK AHEAD AND ASSUME THAT EVERY CAR DRIVER IS A WOULD BE ASSASIN. It aint any use just looking if you don’t realise what you are looking at or for for that matter the reason why you are looking.. Then having looked, responding to and by making any early intervention to any potential danger that may be required. Thus eliminating the danger or subsequently mitigating its effects. Nothing new in that. The new word Not be SURPRISED basically means SEE/ IDENTIFY AND REACT IN ANTICIPATION OF THE WRONG ACTIONS OF OTHERS. There are many causations and many more possible contributory factors to be taken into account for accidents [ many not shown on stats 19 the police stats form] but only about 5 types of accidents ie. Smidsy at/or junctions and roundabouts or corners or overtaking etc. Much of the above is taught at Advance Training levels but I believe that this instruction should be made available to all a lot earlier. As of a norm. Its no use waiting till riders are so called experienced. They need it much earlier and can understand and use it sooner rather than later. Some70% of incidents occur in urban areas and within 5 miles of home and result in some deaths , some serious injuries and mainly minor injuries. 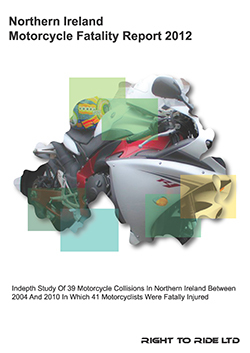 The majority of deaths and serious injuries ,the remaining 30% of accidents , occur out on faster country roads. There is an argument that training by itself does nothing to improve the situation…… wait for it…… its the practical application of such training that does the work. Without putting into practise what has been instructed then one is just wasting ones time. There are many laudable interventions made by many local Authorities. However its very piecemeal and some have a doubtful result. some have more monies than others and perhaps more of a problem then others, the ones with less of a problem may not realise that its their residents who may have accidents on others roads in anothers areas. They don’t therefore consider it a problem. IT IS A NATIONAL PROBLEM. There are many training organisations and Services and individuals within Councils that do sterling work but there is no co ordination nationwide. Each doing there own thing and to their best endeavours spending the monies that they have been allocated but just scratching the surface. Don’t get me wrong there have been many successful interventions and some are being taken up at more than local level. but it takes time and that something some bikers dont have. What is wanted, needed, is a good overall National Plan, the first of its kind in the Uk and possibly the first in the world. This would mean that all the training agencies incl RoSPA The AIM and DSA get together to make a special offer for discounted training at some time in 2015. All at the same time. Also included would be input for free Biker Down Type instruction of First Aid by the various training bodies Ambulance, Fire Brigade,Police, St.John Red Cross etc. This could be supported by the manufacturers, the traders. the insurance companies the social media, the newspapers, TV and local and national news media . All motorcycle publications. and Other organisations, maybe Track Day businesses. and so on. The list is endless for interested parties to have an input either with assisted financing or materials or manpower etc. I know some would say why should an apparent commercial enterprise such as IAM and RoSPA or DAS lose monies by discounting. All i say is that many lives are lost each year and many others also suffer, wives and families and communities. so why not get together with a unified effort and demonstrate that motorcyclists are doing something to help themselves.